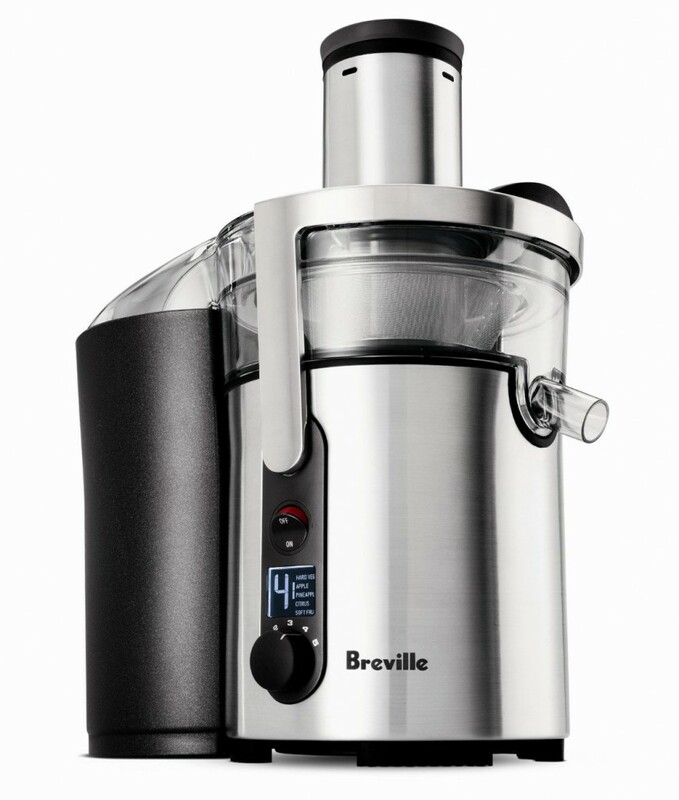 The BJE510XL Juice Fountain is the latest product from the folks at Breville. Packaged in an attractive steel and black housing, this premium juicer will look good sitting on any counter. With a powerful 900-watt motor and 5-speed control, you’ll be able to extract juice from both hard and soft fruits and vegetables. The Breville BJE510XL Juice Fountain is a quality all-in-one juicer. The spout is detachable, and a cleaning brush is included for quick tidying up after juicing. The feed tube is a generous three inches in diameter, making it easy to get big pieces of fruits and vegetables into the juicer without a lot of prep work. With five speeds to choose from, you’ll be able to easily juice both hard and soft fruits and vegetables. The Juice Fountain features the company’s patented Nutri Disc system, which extracts juice without heating it, preserving the natural enzymes. Probably the best feature of the Juice Fountain is the embedded smart chip that allows for automatic power control depending on which fruits and vegetables you’re juicing. The Breville BJE510XL juicer is super simple to use. Simply feed fruits and vegetables through the generous 3-inch tube and the machine will handle the rest. Smart chip will even control the speed depending on which fruits/veg you are juicing. Cleaning any juicer is never fun, but the Juice Fountain has a detachable spout and juice jug, and comes with its own cleaning brush. Definitely one of the easier juicers to clean. Juice is nearly perfect, with no heating and almost no pulp or foam. Powerful motor extracts juice equally well from hard and soft fruits and vegetables. The smart chip does a great job most of the time, and the powerful 900-watt motor means that this juicer will never get bogged down or clogged. It’s simply impossible to make a powerful juicer without a little noise, but it only takes a few seconds to juice even hard veg/fruit, so noise isn’t a big issue. Juice extraction is nearly perfect, leaving behind only slightly damp pulp. In the box, you get the main juicer unit, a froth separator, detachable spout, cleaning brush, and pulp collector. Not only does this juicer look good, but it’s built very ruggedly and can easily handle an entire family’s daily juice needs. The five-speed motor can ramp up from 6,500 RPM for soft fruits to 12,500 RPM for hard vegetables like beets and carrots. With a big three-inch feed tube, it’s easy to feed in your fruit/veg without doing a lot of prep work ahead of time. Everything down to the spout is detachable and dishwasher safe, so clean-up is a snap. The unit also comes with its own cleaning brush. And because the Juice Fountain contains the company’s patented Nutri Disc system, the juice is never heated, thus preserving all of the vital enzymes and nutrients. Definitely one of the best centrifugal juicers available ont he market today.